Water evaporation – Properly dried firewood has a water content of less than 20%. Water in the wood needs to be boiled off (latent heat of evaporation) before temperatures can increase enough to release and ignite combustible gasses. The wetter the wood is, the more heat energy is consumed for this drying process; the poorer the combustion process and the more smoke and creosote are produced; and the catalytic converter in some types of wood stoves ages prematurely. Smoke formation – Wood smoke is fuel! When the wood heats up, solid and liquid components in the wood turn into vapors – a cloud of combustible gases and tar droplets. Once it gets hot enough, with sufficient air supply, these gases and tar ignite and burn in a bright flame. If you can see grey smoke coming out of a chimney, not only is the air being polluted, but also energy is being wasted in the form of unburned vapors. A hot efficient fire will produce almost no smoke. Charcoals – Once all the gases and tars are vaporized and burned off, what is left is charcoal; almost pure carbon that will burn easily, hot, and virtually smoke free, provided there is sufficient air supplied. It takes some skill to start and maintain a comfortable, low-emission fire. Fine, dry wood will heat to the ignition point more quickly than large chunks of wood. Once critical temperatures are reached (around 1,000°F) wood will burn clean and efficiently. This requires sufficient oxygen – thus dampers should be wide open for start-up. Burn only dry, well-seasoned wood. Green or wet wood, paper (except a few sheets of newspaper, if necessary to start a fire), cardboard, and garbage may burn, but they compromise efficiency and contribute to higher emissions. 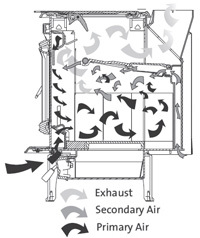 Primary/secondary air is also referred to as single or dual stage combustion. Most modern wood burning units have a dual stage combustion process, where some combustion air is supplied more or less directly to the fuel source (primary air), usually through a grate or air vents, to enable gasification. A second stage (secondary air) supply allows pre-heated air to be injected into the smoke allowing for secondary, and almost complete combustion. 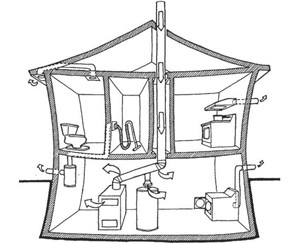 Generally, primary air is controlled by the user, whereas the secondary air is controlled by the draw of the chimney. Creosote is a highly combustible chemical by-product from incomplete combustion of carbon-containing compounds like wood. Chimney fires are commonly caused by creosote deposits in the flue pipe. Creosote condenses on cooler surfaces such as woodstove or fireplace flue pipes. Over time, these deposits can build up, and under the right circumstances (hot gases, embers in the flue) can ignite inside the flue. Precautions: 1) Make sure the fire has sufficient air supply and maintains a high temperature. 2) Burn only dry, well-seasoned wood – nothing else. 3) Maintain sufficient flue gas temperatures (325°-400°F min). 4) Inspect and sweep the chimney at least once per year. 5) If used at all, make sure flue pipe mounted heat exchangers are properly installed. Backdrafting is when the path of exhaust gases is reversed from up and out to down and in. It is commonly the result of negative pressure in the building that contains the combustion unit or a wrong diameter/poorly designed flue. An example would be running a powerful range hood that moves hundreds cubic feet per minute (cfm) of air. The volume of air that is exhausted has to be replaced by what is called “make-up air”. Historically, buildings were less air-tight than today’s energy efficiency standards require. In older structures, make-up air could be supplied through gaps and cracks in the building envelope. However, today’s structures may not have sufficient “make-up air”. Older buildings that have undergone energy efficiency measures or Figure 3. Backdrafting due to depressurization. Source: Combustion Gases in Your Home – Things You Should Know About Combustion Spillage. Canada Mortgage and Housing Corporation (CMHC) new structures may require additional ventilation in order to prevent back-drafting. Precautions: 1) Make sure a sufficient amount of makeup air is provided when bathroom fans, range hoods, whole house fans, and other appliances that exhaust large amounts of indoor air to the outdoors are running. A qualified installer should ensure that appropriate amounts of air are available. 2) Make certain the chimney or flue system is drafting properly – smaller diameter pipes tend to draft better. Smoke venting back into the room when the stove door is opened is a good indicator of a bad draft and may indicate a plugged chimney or poor design. 3) Pay attention to signs of back-spilling on other combustion units in the house. These are dark streaks of soot on the outside of an appliance with an open flame. 4) Install CO detectors on every floor of your home, include the basement. Carbon Monoxide (CO), a poisonous and odorless gas is produced during most combustion processes. During oxidation (the combustion of a carbon-containing compound like wood), carbon monoxide formation occurs when inadequate oxygen is supplied. CO replaces oxygen in your blood, leading to death. Carbon monoxide is colorless, odorless, tasteless and slightly lighter than air. Precautions: 1) Make sure the fire has sufficient air supply for complete combustion. In the presence of oxygen, carbon monoxide burns with a blue flame, producing carbon dioxide. 2) Install CO detectors on every floor of your home, including the basement. A detector should be located within 10 feet of each bedroom door, and near or over any attached garage. Detectors should be replaced every five to six years. There is a chance that hot embers are still hidden in clumps in a seemingly completely burned pile of ashes in the stove. If those ashes are cleaned out and moved to a place where combustible materials are close by, there is a chance of the embers reigniting and causing major damage, or releasing CO.
Precautions: 1) Carefully rake through the pile of ashes and watch for pockets of embers before disposing of it; or, use them to kindle the next fire. 2) Use only noncombustible implements to move ashes, such as a small closeable metal pail with a metal lid. 3) Ashes should be emptied into a metal garbage can stored outdoors away from combustible material, or in a damp soil pit. All wood burning systems are strongly influenced by the type of wood that is burned. Very dense, dry wood burned with ample oxygen supply (wide open dampers) has the potential to overheat stoves and stoves and flue systems. If metal is redhot – the heat is excessive. Precautions: Special care must be taken when burning extremely pitchy wood (also known as “fat” wood) as pitch can result in excessive temperatures that can melt or burn through metal. Always monitor the type of fire in a wood burning device. Wood Tips – size, moisture content, storage, etc. A cord of wood is the standard unit of measurement for firewood, and measures 4ft x 4ft x 8ft. Because almost no one burns 4‘ long pieces of wood, fractions of cords, often called “face cords”, “stove cords” or “furnace cords”, are usually sold. These are piles of wood 4’ high and 8’ long and as wide as the length of the individual pieces. Make sure to convert the face cord back to a full cord when comparing prices for firewood. The size of firewood most efficient for your stove is determined by a variety of factors, and will ultimately affect ease of use and burn properties. Length is commonly determined by the width and length of the fire box. It is advisable to cut the rounds to a few inches less than the shortest dimension of the two (length/ width). This allows for loading the fire box in either east-west or north-south orientation depending on the changing heat demand throughout the heating seasons. Another size factor to consider is ease of handling. While it is tempting to maximize the length and thus the amount of fuel per piece of wood as to reduce the frequency of reloading, there is a limit at which it becomes awkward and inconvenient to handle. Common lengths are between 12″ and 20″. Firewood can be split to a variety of sizes, often ranging from 3″ to 6″ in diameter measured across the largest cross section. The different sizes will make it easier to build and maintain different fires to adjust to changing heat demands. Smaller, split pieces ignite and burn more efficiently than round wood. Larger pieces are best for longer time between refueling. Figure 5. 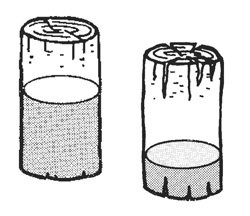 Wood water content before seasoning (left) and after seasoning (right). Source: Efficient, Convenient Wood Heating. Canada Mortgage and Housing Corporation. Burning wet/green wood leads to incomplete combustion and thus creates significant smoke, potentially dangerous creosote deposits, and less heat. Green wood can contain up to 50% moisture by weight. Remember: before any heat can be released to heat a room, the energy stored in the wood is spent (and thus wasted) to evaporate moisture contained in the wood. 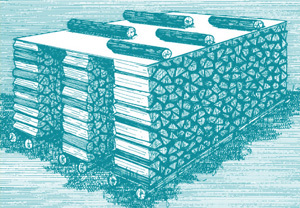 An example: A small stack/big armload of properly seasoned pine firewood weighs about 40 pounds. At 20% moisture content, 8 pounds (or about a gallon of this wood) is water. Properly seasoned (dried) firewood has a moisture content of less than 20 percent, burns more efficiently, and produces less smoke and creosote. In a live tree, the bark serves as a barrier that protects it from losing water that is transported up and down its trunk. To facilitate the drying process of firewood, this barrier needs to be broken or it will take twice as long. The wood should be cut to the desired length, split and stacked, off the ground, preferably in freestanding single rows, and exposed to wind and sun. Well dried, seasoned wood sounds hollow when it is rapped on and has cracks on the grayish colored ends. Depending on weather and wood species, this drying process can take from 6 months to two years. After the wood is dry, it can be brought inside a shed or other building protected from the elements (but provided with some air circulation) until it is used. DO NOT MOVE FIREWOOD OVER LONG DISTANCES. Besides becoming increasingly uneconomical, transporting firewood can drastically increase the spread of tree-killing insects and diseases. Examples of these insects and diseases include the native mountain pine beetle, and invasive species like the Asian longhorned beetle, emerald ash borer, and gypsy moth. Even without visible bugs, holes, burrows, sawdust, or other weird looking stuff on it, wood should not be considered “safe” to move. These tiny threats can significantly damage forests, and are spreading fast. While several states have firewood movement restrictions, others advocate leaving firewood at home. If you are buying firewood, ask the seller where they got the wood. If it is not nearby, or if they do not know where the wood is from, consider another firewood dealer. As a general rule of thumb, 50 miles is too far, and 10 miles or less is considered best. The closer to the property where it is actually burned the better, and that includes the firewood for your camping trip. Quality wood pellets are a convenient and very clean burning fuel source that can be used with automated fuel handling systems. Usually available as 40# bags or in bulk, they are produced with tight quality standards. They are small pills, made of mostly sawdust and a binding agent, usually lignin, and are highly compacted. Consistent size, ~ ¼” diameter, ¾” long. Low amount of fines, <1%. The amount of fines influences the smoothness and flow of the pellets in the feeder as well as combustion properties. Mechanically durable, as to be able to endure numerous handlings without breaking and producing fines. No additives. Lignin, a natural component found in wood, should be the only binding agent. Density of pellets. Wood pellets should be highly compressed. The looser the wood pellets, the higher the amount of fines. Quality wood pellets have minimal ash content, which means they burn clean and leave very little residue (ash). This makes for long intervals between cleaning out the ash pan. Two “grades” for pellets are available today, “Standard” and “Premium”. While they have the same energy content per pound, “Premium” pellets must have an ash content of <1%. Care has to be taken when storing wood pellets. Their low initial moisture content makes them hygroscopic (water loving), and storing them in an environment with increased humidity will allow them absorb moisture over time. Source: Canada Mortgage and Housing Corporation (CMHC). A Guide to Residential Wood Heating , 2008 (About your House: Combustion Gases in Your Home, 2006; About your House: Efficient and Convenient Wood Heating, 2009). All rights reserved. Reproduced with the consent of CMHC. All other uses and reproductions of this material are expressly prohibited.